An olive green jacket is one of my favorite layering pieces for fall. Try these eight outfit ideas for wearing your army green anorak jacket! 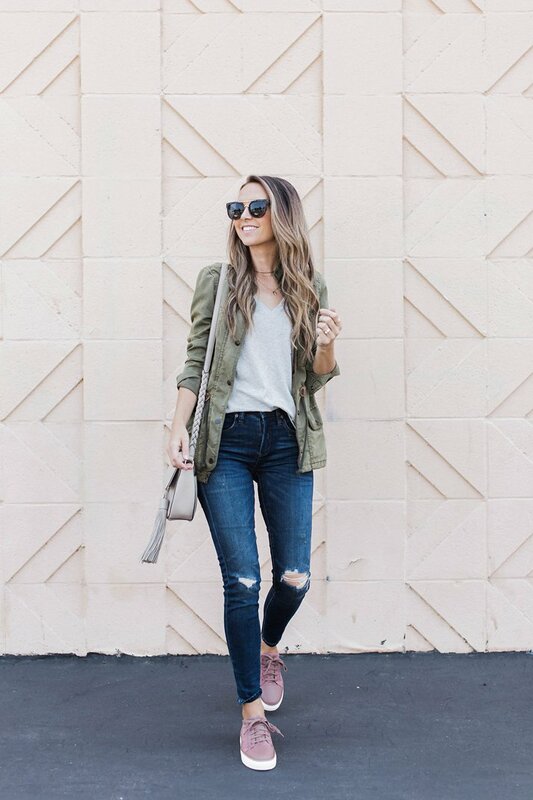 An olive green army jacket is a great layering piece for any outfit! The anorak jacket/military jacket/utility jacket/army jacket/olive jacket is one of my most versatile and most worn jackets in my wardrobe. It’s a perfect lightweight jacket for fall, so today I’m sharing how to style an army jacket, and if you don’t own an olive green jacket, THIS ONE is a great choice, and I’m also loving THIS ONE. An olive jacket is a great way to add a little something to your basics. 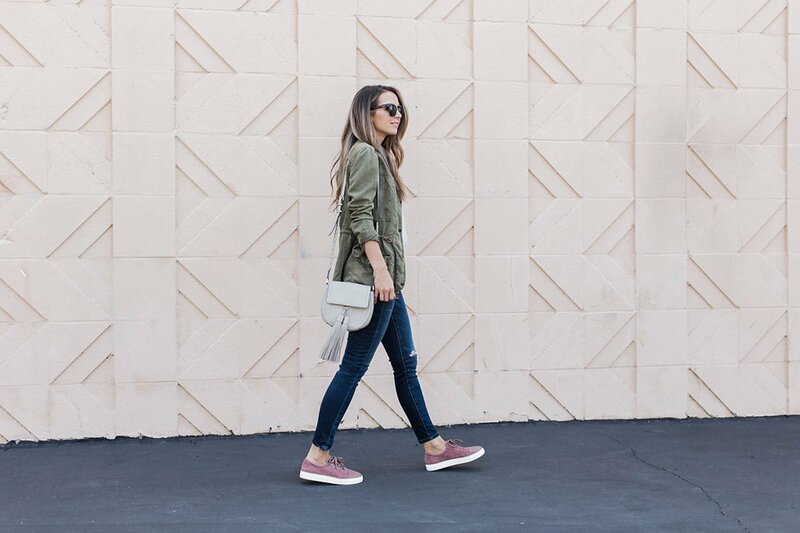 The above outfit is super basic – jeans, a tee, and sneakers – but the olive jacket makes it a little more special and interesting. 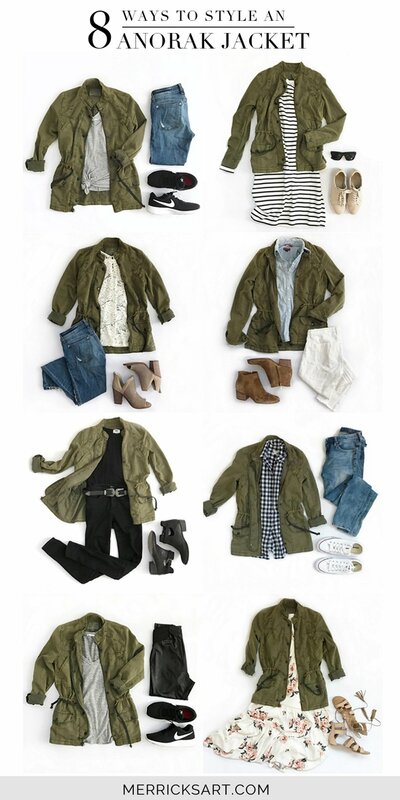 Now check out some other ways to wear an army jacket! Shop some of my favorite anorak jackets in the widget below! LOVE the one with the jumpsuit. Army green jacket is a staple for me! Waiting patiently for spring so I can whip mine out! with the new website look the photos become so small and there’s no way to enlarge them. It’s hard to see the outfits….. If you have the link to the post as a favorite, you may have to up date it. It happened the same to me and then it worked fine after the refresh. Best regards from Argentina! Of all the jackets you linked, I love the one you’re wearing the most! Where can I find it?? I love everything you do/wear, and you’ve inspired me to improve my sewing skills so I can make some clothing for myself! EEE! Luckily I am a small and I just snagged it! Thank you for the link!! I can’t wait to get it!! I’m new to your blog. I noticed a variety of shoes. Many going with different outfits. Have you done a post on must have shoes? This is a pretty olive colored jacket. These are all awesome! I have an olive jacket, and never wear it as much as I want to! This is great style inspo! Love your blog and your style. I followed the very first link to buy the jacket you’re wearing because it looks just perfect. But then I was disappointed when it arrived– it’s much different than the one you have on. It’s really bulky (despite sizing down to XXS), the sleeves are too short and there are a lot of differences in the details. So I guess everyone just be warned that the one in the photos isn’t the one you’ll get when you click on the link for it. SO cute! Love all of the options! Despite all these facts, I can say that this process is very complicated. I hope that you will continue to write articles here. Thank you! I will be waiting for your new posts. Thank you for sharing your look! I also like to combine different things and accessories to create new images. Recently read in article https://www.bikerringshop.com/blogs/news/how-a-stingray-wallet-makes-you-stand-out-from-the-crowd how to use wallets and bags in their looks. This is very informative! thank you so much, I saw this jacket and knew i would love it. The pants are so fun and i loved the detail. MY FAVORITE ARE GREEN OLIVE AND Flight Jackets STYLE TOO. Keep sharing more like it.